radiation to heat water and other polarized molecules within the food. This excitation is fairly uniform, leading to food being adequately heated throughout (except in thick objects), a feature not seen in any other heating technique. Basic microwave ovens heat food quickly and efficiently, but do not brown or bake food in the way conventional ovens do. This makes them unsuitable for cooking certain foods, or to achieve certain effects. Additional kinds of heat sources can be added to microwave packaging, or into combination microwave ovens, to add these additional effects. 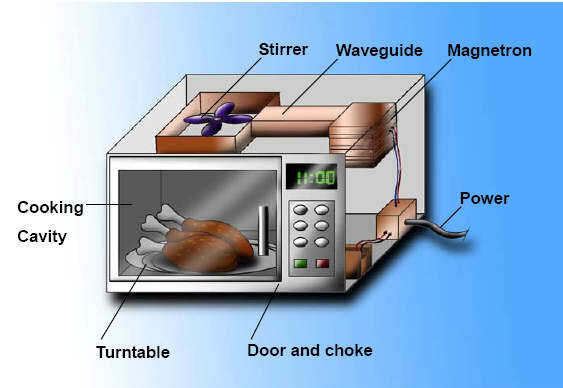 Microwaving food raises several safety issues, largely connected with leakage of microwave radiation outside the oven, as well as reducing risks, such as that of fire from high temperature heat sources. There has been some concern that microwaves might damage food (microwave radiation has sounded alarming to some), but the dominant view is that microwave food is at least as safe as food cooked by other means.